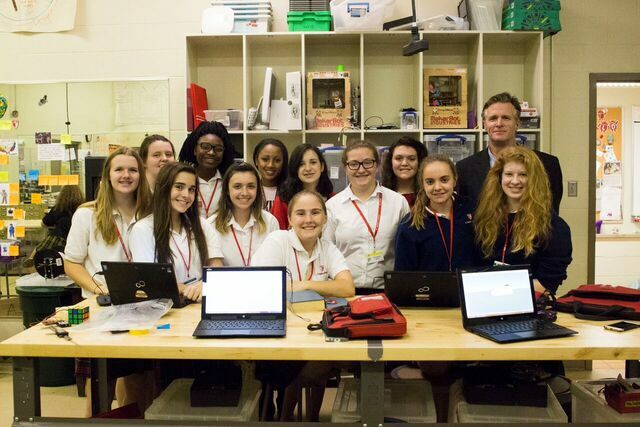 Though they live on different continents, students at St. Joseph’s Academy in Baton Rouge, Louisiana (an all-girls school known for its student-run technology repair center) and a group of girls at Ekalavya School in Bangalore, India, were partners this fall in LUV’s Global Inventors course. Together, they studied electricity, computer aided design (CAD) and 3D printing, while learning about each other’s daily lives and cultures via video message exchange. One girl at each end of the partnership reflected on the experience. Grace R. and her classmates at St. Joseph’s Academy in Baton Rouge, Louisiana, were partners with girls at Ekalavya School in Bangalore, India, this fall for LUV’s Global Inventors course. For the past several weeks, I have been participating in the Level Up Village Global Inventors program. 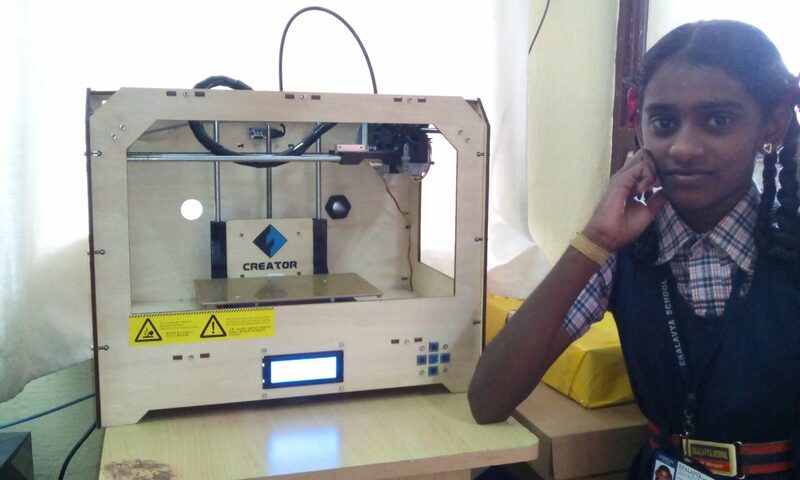 I was inspired to take Global Inventors when I realized what a great opportunity it was to further my interest in 3D printing and also to learn about other places around the world. I was also interested in finding out the similarities and differences between our technologies here in the U.S. compared to those in India. In partnering with Ekalavya School in Bangalore, India, I was able to learn how electricity and solar power are used in both of our countries. During the program, I had to overcome several challenges using CAD software. One of my greatest challenges was just being unfamiliar overall with the SketchUp software. Once I got over that hurdle, it was really enjoyable to design and then print my designs. My favorite part of the process was being able to hold the finished product in my hands, knowing that I was the one that designed it! 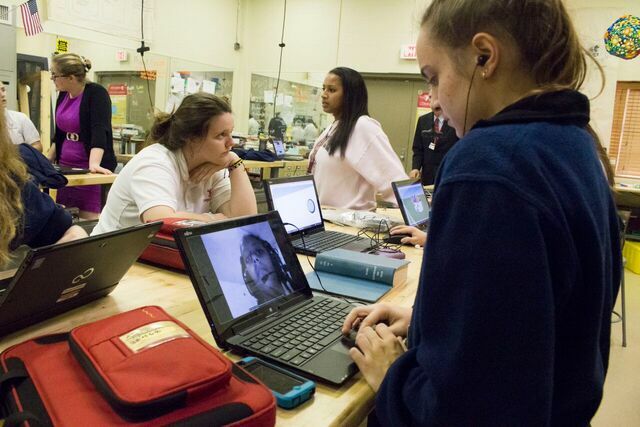 Girls in Baton Rouge and Bangalore learned computer aided design (CAD) and 3D printing in Global Inventors. One of my favorite parts of the Level Up Village program was getting to do the virtual exchange with a partner in India. It was amazing to know that they were on the other side of the world but were still doing the same types of things we are doing technology-wise. Since this was my first time participating in a global collaboration, it was a little uncomfortable at first. However, after a short while, I felt like I really got to know my global partner Sushma. It was awesome to learn how similar our lives are. We have similar interests in things like food, music, and of course, 3D printing. Over many weeks we shared with each other information about our cultures, schools, family and so much more, as well as discussing our various designs. The Global Inventors course was a great opportunity for me to further my interest in STEM fields for many reasons. I was able to become very familiar with CAD software as well as learn a lot about electricity and solar power. I would recommend other girls take this course if they are interested in STEM/STEAM fields in ANY way. Even if they don’t think that STEM is for them, they should try it out because chances are, they will be surprised at how fun it is! My name is Sushma. I am 14 years old and I am in the 8th standard in Ekalavya School in Bangalore, India. My favorite subject is English, and I also enjoy math with Mr. Mahipal. Previously, it was difficult for me to use the computer but now I have learned so many things about computers. This is the first time I have learned 3D printing, and I really enjoyed it. 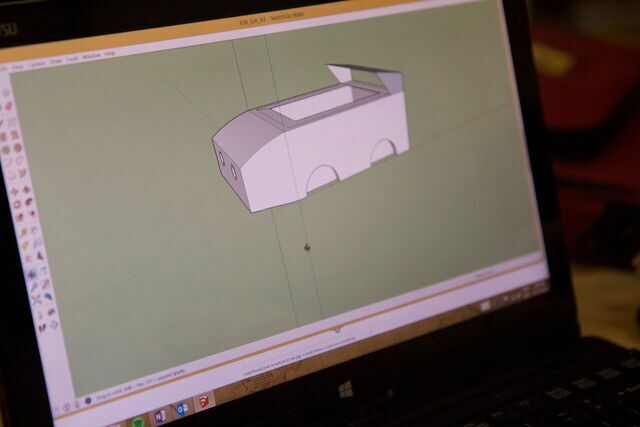 In the beginning, I experienced some challenges like using SketchUp to make designs for the 3D printer. But with proper planning, guidance and the help of my teacher, I made designs and printed them. As a part of the course, I also learned how to convert solar power to electricity. We can install solar electric systems at home, school, etc. Sushma and her classmates at Ekalavya School in Bangalore, India, enjoyed learning new tech skills in collaboration with U.S. students as part of LUV’s Global Inventors course. This is the first time I have had a virtual global collaboration. I feel very lucky and I am very happy to have Grace as my U.S. partner student. Our lives are different as Grace and I are not from the same country. But in the field of science and technology, Grace and I have learned the same things through the LUV course. Through her video messages, I came to know many interesting things about Grace’s school, city and country, the United States. We both like English, and coincidentally, we both love the color pink. It seems we think very much alike and we respect each other’s interests and beliefs. One surprising moment in our video letter exchange was when she introduced her father. I felt very happy and elated. I also feel fortunate to have more than one friend in this course and to have a friend like Grace. I would like to recommend that other girls take this course. It is beneficial for the overall development of students. I am so thankful for the LUV course. A student at St. Joseph’s Academy watches her partner’s video message at the beginning of the class period. 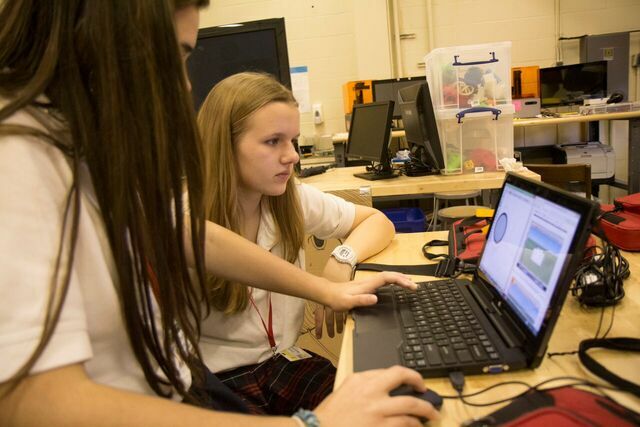 Students at St. Joseph’s Academy in Baton Rouge were paired with Global Partners in Bangalore, India, for the duration of LUV’s Global Inventors course.